Enzym Company participates regularly in projects aimed at protecting the environment and reducing the impact of human activities on the environment. We care about environmental cleanliness by developing new conservation measures for natural resources and promoting prudent use for production purposes. Making our production and manufacturing technologies environmentally friendly is a top priority for Enzym. Our Company believes that businesses, which are aware of the impact that manufacturing has on the environment and feel responsible for the future environmental situation in their region, have to promote a change. An important strategic site is the complex of local wastewater treatment facilities, which provides complete biological treatment of industrial wastewater. Biogas, formed as a result of acid-free wastewater treatment, is an alternative to natural gas and covers about 70% of the Company’s energy needs. Our wastewater treatment plants are unique in Western Ukraine and serve as an example for many Ukrainian businesses. One of our most effective environmental solutions is the installation of heat recuperators, which ensures the re-use of used thermal energy. Heat recuperators reduce our regular need for large amounts of energy for production purposes, thus reducing emissions. Our Company is gradually installing energy-saving LED lamps in all the premises; we actively support recycling (paper, plastic, glass and household waste), and we have also organized a collection of used batteries for rational high-tech recycling. General concern over problems related to environmental protection and safety affects more and more countries, and our Company is no exception to this development. Preserving natural resources today is a lesser alternative to complete refusal of using natural resources for production purposes. Our Company uses the latest equipment and top international technology to implement environmental protection measures. We regularly take part in international conferences where we share our knowledge in the area of environmental protection with many other companies. We cooperate with international organizations promoting environmental preservation and protection, which allows us to gain valuable experience and knowledge and use them in practice. For achievements in environmental sustainability and innovative approach, the Company was presented with a top award in the category Green City: Lviv and Environment as part of the Face of the City contest sponsored by the Lviv Municipal Council and the Lviv Chamber of Commerce and Industry. In 2004, the Company launched the implementation of a high-tech ecological wastewater treatment project that meets modern global standards. Project investments amounted to more than EUR 5 million. 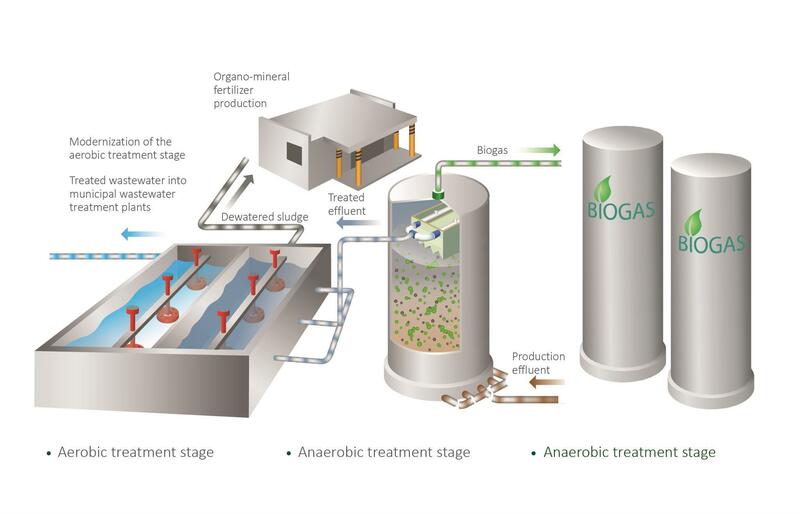 Biological wastewater treatment produces raw materials for organo-mineral fertilizers, as well as an alternative natural gas – biogas (methane) that is used to provide the Company with thermal energy.